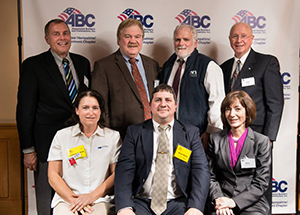 Associated Builders and Contractors of NH/VT held its annual Excellence in Construction Awards ceremony last month. • Pro Con Inc. won five awards. The Chelsea Residence Inn by Marriott was recognized with a Design Build Excellence Award and a Sustainable Building Award. Pro Con was the architect and construction manager for the five-story hotel in Chelsea, Mass. John Stebbins of XSS Hotels is developer and owner of the project. The Lowell General Hospital Medical Office Building was recognized with a Design Build Merit Award. Pro Con was the architect and construction manager for the three-story, 30,000-square-foot medical office building and the 347-car parking deck. Aviv Centers for Living was recognized with a Merit Award for Commercial Construction over $10 million and a Sustainable Building Award. Pro Con was the construction manager for the 124,000-square-foot, $35 million, senior living facility in Peabody, Mass. Koningisor, Luciano & Associates of Framingham, Mass., was the project manager and KDA Architects of Voorhees, N.J. was architect. • Cobb Hill Construction won three awards. Cobb Hill received the Historical Restoration Excellence Award for its work on the Bridges House in Concord. The purpose of this project was to increase the capacity of the property to host larger events and extend its use to legislators, civic and business leaders, and visiting dignitaries from around the nation and world. The results of the renovations provided an attractive and functional setting for non-profit and community events. The Commercial Under $2 million Merit Award recognized Cobb Hill for its work on Tad’s Place at Havenwood-Heritage Heights Retirement Community in Concord. Pulitzer Prize-winning playwright Tad Mosel moved to the Havenwood-Heritage Heights in his retirement and was approached by Mike Palmieri, the organization's CEO and president, about his plan to bring an auditorium to the residents. Mosel quickly became a generous donor for the project. The renovation included a total interior remodel along with raising the height of the roof on one side of the building to allow for a cathedral ceiling and the necessary ceiling height for a raised platform in the performing area. Cobb Hill also received a Community Service Award in the Commercial Under $2 million category for its work on The Friendly Kitchen in Concord. The new building replaces the old Friendly Kitchen at the Hope House, which was lost to a fire in April 2011. • Eckman Construction was recognized for two recent projects. The Academy Building at Pinkerton Academy earned a Merit Award for Institutional Projects with values over $10 million. Eckman completed the new 135,000 square-foot classroom building in the middle of Pinkerton’s Derry campus in 2011. It was designed by Marinace Architects of New Hampton. The adaptive reuse of a 1916 mill building in Lawrence, Mass., earned Eckman a Merit Award in the Historical Restoration category. Union Crossing was completed in 2011 and has sixty affordable apartments in a 5-story brick mill building next to the Merrimack River. Eckman worked for the non-profit Lawrence Community Works on the project, which was designed by Coldham & Hartman Architects of Amherst, MA. • North Branch Construction was honored with an Excellence in Construction Award for the Kingswood Regional Middle School, High School and Technical Center project in Wolfeboro. Retired Governor Wentworth Regional School District Superintendent of Schools Jack Robertson, current Superintendent of Schools Kathleen Cuddy-Egbert, GWRSD Building and Maintenance Committee Chairman Ernest Brown, and Project Architect Chip Krause of CMK Architects joined North Branch’s Project Manager John Beaver and Project Superintendents Julianne Cardinal and Bruce Blazon on stage to accept the award.